Just a minute ago on HBO, hit comedian Dane Cook gave Mortal Kombat a bit of free publicity. 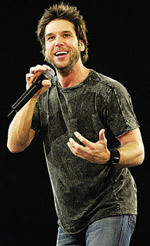 In front of millions tonight during his first ever HBO special, Dane Cook: Vicious Circle, Dane referenced Mortal Kombat during one of his skits. The quote happens towards the end of the show, during his one night stands skit. The quote is definitely for adults only but is fairly entertaining and involves the daze your character is in before a Fatality happens. Because of it's adult nature, I wont post it here. It's better to see in video form anyways. He also used this reference when I saw a pre-HBO show testing of his act when he came to Chicago, IL on April 13, 2006. A few days later he filmed the HBO special in Boston, MA and he obviously kept the refrerence in because of the positive feedback from the audience. This is not surprising for most Dane Cook fans, because he is a huge video gamer. Dane has previously made references to both Super Mario Brothers and Tekken in his skits, but this is the first reference to Mortal Kombat. I recommend all of you you catch the follow up airings of the show to catch the bit, and I'm sure HBO will have it available for purchase on DVD by the holiday season. whoo. dane cooks comedy came to my town. well, he didnt but his tourgasm did. oh, on HBO's entourage the show the boys playing deception as well. HBO Loves MK aparantly. That Comedy special goes on ON DEMAND tomorrow so ill probably watch it then. I recommend all of you you catch the follow up airings of the show to catch the bit, and I'm sure HBO will have it available for purchase on DVD by the holiday season. and why would i buya Dane cook DVD just to hear an MK reference that lasted one second? don't mean no disrespect, though. and i don't mean to flame you. Obviously you would buy it if you liked the show... And no I wont post the comment because there are youngins that come to this website, and also it is MUCH FUNNIER seeing it said instead of just reading it typed up. Then record yourself telling the joke and upload it. C'mon, how could you tell us about it and not tell us a joke. That's like: Dude 1: Did you hear what happened to the crocodile hunter, steve erwin? Dude 2: No, what happened? I'm a big fan. Dude 1: *walks away* Why are you tormenting us? Give a spoiler warning or something. Otherwise this is just an advertisement. It's not for kids, so I can't post it here. Are you all nuts? No. Determined. A lot of things that are on this board are "not for kids". Mortal Kombat itself is "not for kids". Post the joke Pat. Or atleast PM it to me. You really need to see the show to see the humour and see how the joke started. Dane Cook jokes aren't just a few lines, he has these elaborate stories with some strange endings and often leads in to other stories/jokes which it makes his shows so funny (IMO). I pm'd you the "gist" of it. Thanks Dave! I was waiting for it to appear on YouTube. Now people can watch it and really "get" it. Heh, look what I found: WARNING: Not for kids.